From vampurrs to dogosaurs, there are few things as irresistible as a pet dressed up for Halloween. Make sure your pet’s costume is as safe as it is spooky with these tips. Make sure your pet’s costume fits properly and comfortably. One that is too tight could restrict your pet’s breathing or movement, while a too-loose ensemble could cause your pet to trip or become tangled. Keep it light—some costumes may be too heavy for your pet or cause him to overheat. In addition, your pet’s costume should never cover his eyes, ears, nose, or mouth. When it comes to pet costumes, it’s best to forgo the bells and whistles. Watch for loose, dangling accessories that could catch on furniture or other items around the house as well as small parts and pieces, like buttons or beads, that could present a choking hazard. If you’re planning to take your dog trick-or-treating, you’ll also want to be sure his costume can be easily spotted in the dark. Costumes can be stressful—and painful—for some senior pets. If your pet has a medical condition like arthritis that could make dressing up especially difficult, try opting for a festive bandana or collar instead. Look for signs of stress. Some pets don’t mind humoring their humans on Halloween. Others, not so much. Let your pet get comfortable with his costume by trying it on early and often—several times before the big night, if possible. Then watch carefully for clues of discomfort, from pinned ears or a tucked tail to pawing, shaking, scratching, running, freezing, or hiding. The bottom line: If your pet seems distressed in costume, don’t force it. No pet costume is complete without a collar, leash, and ID tags. 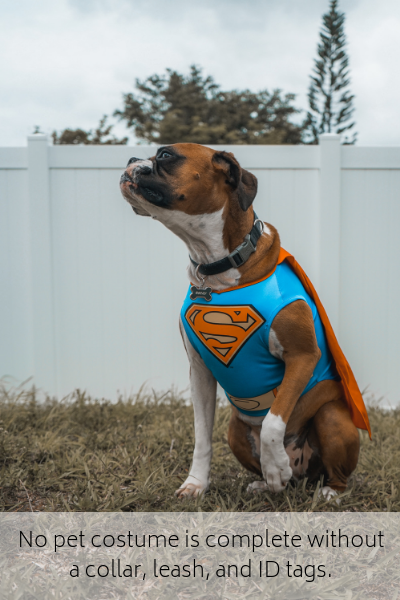 Whether your pet is accompanying the kids for a spooky stroll around the block or greeting the neighborhood ghosts at home, it’s always better to be safe than sorry. Before the festivities begin, take a moment to make sure your pet can wear his collar and leash comfortably in costume, his tags are secure, and your microchip information is also up to date, just in case. Your pet’s Halloween attire may be cute, but it can quickly become a hazard without proper supervision. Pets can easily get tangled, choke, overheat, or otherwise injure themselves while wearing a costume unattended. Be sure to keep an eye on your pet at all times—and if you have to leave him alone, take the costume off and store it someplace safe before you go. If you have any questions about your pet's comfort and behavior—in any situation—don't be afraid to get in touch with us!